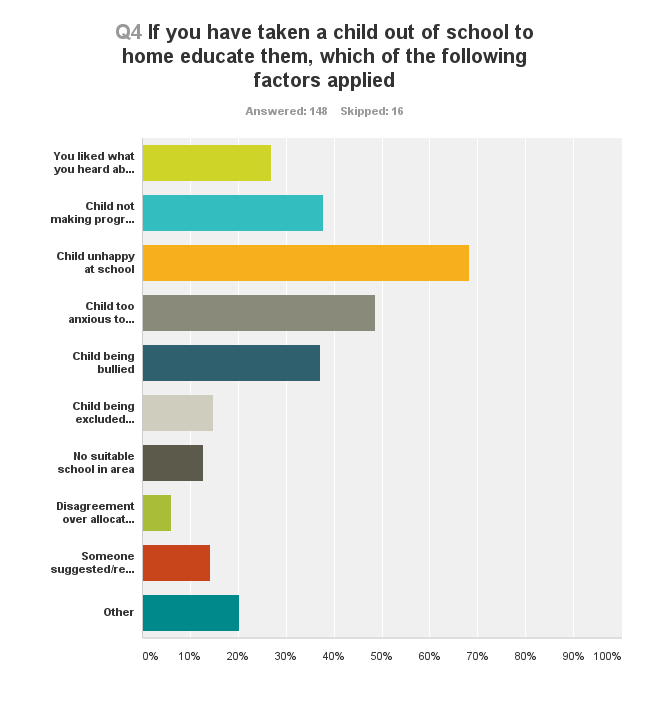 It’s called “elective home education” but where a child has special needs, parents may feel the choice has been forced on them, and however much parents go on to devote themselves to home education and however positively it turns out, parents remain absolutely clear that their children have been badly let down. Child very unhappy at school and education was poor. Other schools refused to take him, saying they couldn’t meet his needs. We took our daughter out of school when she was 9; she is now 12. She had been kept down a year (illegally, we later learned) and was bullied, with little support from the school to tackle this. School didn’t take into consideration my sons practical needs and need for supervision. Many times I would come to collect him and find him wandering around away from the class and no teacher supervising him. He could have easily gone out of the gates without staff noticing. Academy schools seems to get away with not supporting SEN children as they and I quote “have to spend money”. There is no support in place for children if a schools de facto response is don’t spend money. Children out of the normal curve of distribution are ignored and in some cases treated so badly they become anxious. It is worse in academies as when you ask for help the local authority have less control. We don’t want to homeschool but have so far not managed to find a solution. I looked at 18 secondary schools, mainstream, specialist, independent, local authority run, charity run. They seemed to be either somewhere he would be happy, but receive a life skills based education, or somewhere he would get an education but would be anxious and desperately unhappy. Home education seemed the only option if he wanted to get an education and have good mental health. ( Aspergers diagnosis, academically able but can’t function around more than a few people at a time). The child was ‘asked’ to leave school. Child held it together then huge meltdowns at home. School did not understand this. Emotional based school refusal and has been diagnosed with post traumatic stress disorder following school issues. We have just lost our tribunal to send our 11 year old to a specialist school. Local authority want to send him to mainstream school which I do not deem to be suitable so currently he’s out of school. This entry was posted in Uncategorized and tagged school, SEN, special needs, survey on November 2, 2015 by Fiona Nicholson. This is very sad to read – but important to highlight. Thank you for doing that. From my experience on the support groups, it seems that, what some would consider, ‘forced’ home education (rather than elective) is a problem that’s extending to other situations too.